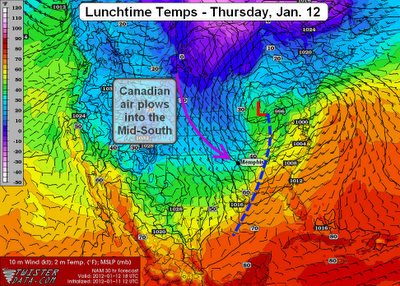 MWN Blog: Arctic Express arrives in Memphis tomorrow morning! Arctic Express arrives in Memphis tomorrow morning! Today's weather pattern is akin to taking a one-stop flight without having to change planes - and we're sitting at the layover airport! The first mildly bumpy leg of the flight occurred last night as low pressure moved directly overhead and was preceded by widespread rain and some thunderstorms during the late afternoon and evening hours. Fortunately, the possibility of severe weather never materialized and general thunderstorms dotted the radar but were not widespread. 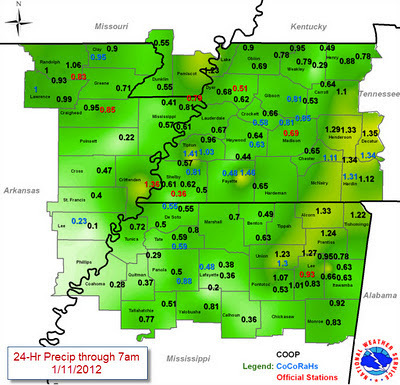 Precipitation totals from yesterday's storm system are shown below. The next leg of the journey will be on the "Arctic Express" which moves through early Thursday morning. In the wake of a strong cold front, we'll see temperatures fall through the 30s during the day with gusty wind as high as 35-40 mph from the west-northwest. In addition, leftover moisture in place from yesterday's system could get squeezed out in the incoming cold air and fall as light rain and/or snow. No accumulations are expected, but there will be a chance to see some snow showers between 7am and noon Thursday. Due to the falling temperatures and gusty wind, wind chill readings in the upper teens to lower 20s will be common Thursday afternoon across the region. It will definitely be colder by the afternoon rush hour than it will be early Thursday morning! Looking ahead, skies will clear tomorrow evening and temperatures will fall into the mid 20s in the metro. You can thank a steady 10-15 mph wind for keeping them from dropping any lower, though wind chill readings on Friday morning will be in the mid teens. Dry weather will continue through the holiday weekend with a warming trend evident by Saturday as temps climbing back to 50+ during the afternoon. Our next decent chance of rain will occur late Monday into Tuesday as the next system takes shape. 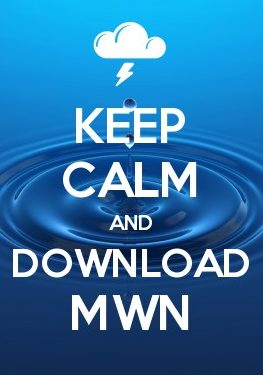 The complete forecast can be found on the MWN Forecast page.